ACSR coyote conductor is a popular type of aluminum conductor steel reinforced wire. 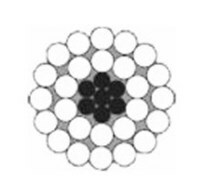 This wire is produced according to the BS215 standard. Like other acsr wire, coyote conductor also consists of stranded aluminum and steel wire. The aluminum wire diameter is 26/2.54mm, and the stranding steel diameter is 7/1.91mm. Because of its high tensile strength, efficient conductivity and light weight, the acsr coyote conductor is very hot. As a professional acsr coyote conductor manufacturer in China, Huadong produce the wire in strict accordance with international standards. You can rest assured of our acsr coyote conductor quality. What’s more,we sell our wire directly. That means you can get acsr coyote conductor factory price. If you interested in our conductor, feel free to leave your message. As we all know, the coyote acsr conductor has the sample structure, which means easy erection and maintenance. And aluminum is the main raw material of this conductor, so it has relatively low price and large transmission capacity. What’s more, the conductor can be easy to suit the laying of special geographical conditions such as rivers and valley. So it is widely used in overhead transmission. And owing to this conductor has high tensile strength and light weight, it is suitable to cover extra-long spans with fewer support. If you want to customize the conductor, Please send us your requirement. If you want learn more about huadong cable group factory information & cable price, please feel free leave your message, our price list will send you in 12 hours.